PHOTO CONTEST - M&E "Lehigh Limited"
The Lehigh Limited was the first public excursion in the area in over 15 years, operating over rare-mileage freight-only trackage through New Jersey and Pennsylvania. Many railroad photographers were trackside to document this historic event. These photographers were encouraged to submit up to three of their best photos of the Lehigh Limited to the M&E for the Lehigh Limited Photo Contest, which was judged by M&E staff. Seth Koehler's photo was chosen as the winner, and Seth received a 45-minute cab ride in an M&E locomotive for himself and one guest on Sunday, September 15th during one of the Whippany Railway Museum’s caboose trains. The submission deadline was Friday, August 30th at 4:00 PM EST. 1. Submissions must be emailed to Rudy Garbely at rgarbely@merail.com no later than Friday, August 30th at 4:00 PM EST. 2. Each photographer may submit up to three (3) photos. 3. 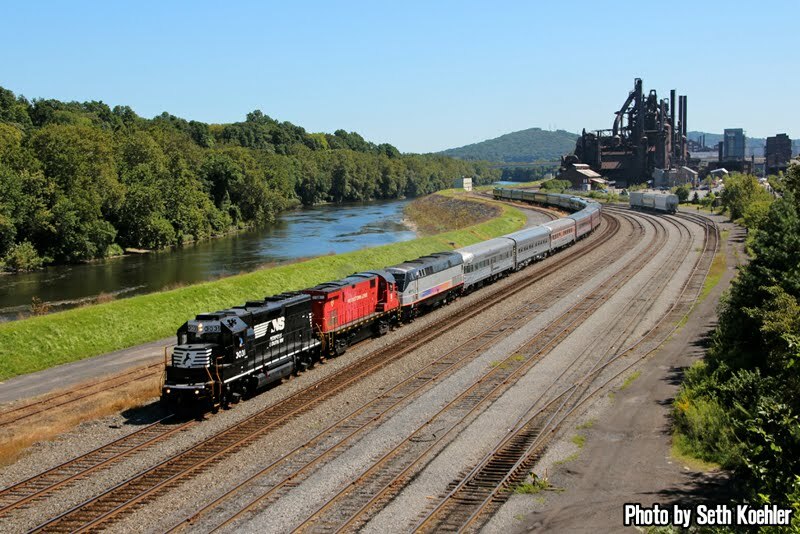 Only photos of the August 24, 2013 Lehigh Limited excursion will be accepted as entries. 4. Only one winning entry will be selected. The winner and a guest will receive a 45-minute cab ride in an M&E locomotive on Sunday, September 15th. Both riders will be required to sign a liability waiver prior to boarding the locomotive. The M&E reserves the right to substitute locomotives when necessary. 5. By submitting their photo(s) to this contest, photographers agree to allow the M&E to use and republish the photo(s) for future print and digital marketing efforts. Photographers will receive appropriate credit if and when their photos are used. 6. Include your name and phone number in your emailed submission. 7. Include caption information for each photo (location, time, etc.). 8. The minimum physical dimension for digital files is 3000 pixels in width (or height for vertical photos). 9. Photos must be saved as JPG or TIF files. 10. Photos may be digitally cropped, but not digitally edited for color or content. 11. Any photo taken while trespassing on railroad property will be disqualified and reported. Stay safe!